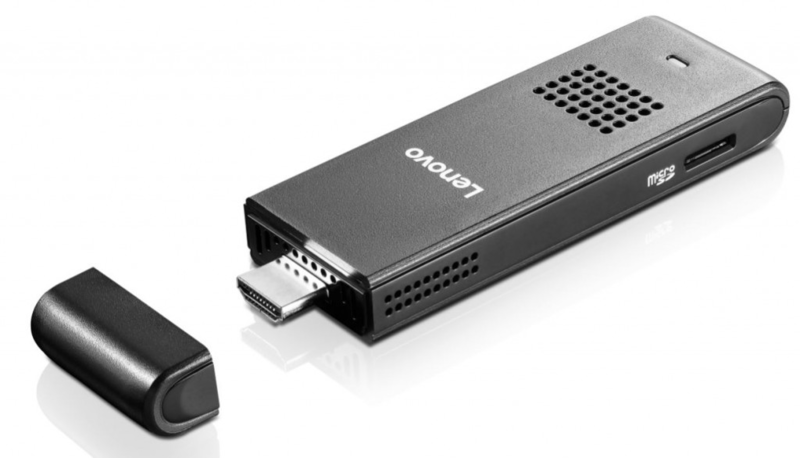 Today, Lenovo announced their first compute stick, the Lenovo ideacentre Stick 300. Designed for consumer usage in the home and on-the-go, the new pocket-sized compute stick is powerful enough for entertainment and web browsing, while affordable enough for existing PC owners to justify owning a second or third mobile PC option. The ideacentre Stick 300 features an Intel Atom Processor Z3735F and the familiarity of Windows, initially shipping with Windows 8.1 but will be eligible for a free upgrade to Windows 10 starting July 29. The ideacentre Stick 300 expands the mobile computing experience and options for savvy shoppers and is suitable for use in the home, dorm or office, while simultaneously offering portability and convenience for travelers. For the wallet friendly starting price of US $129, this plug and play technology can transform almost any HDMI compatible TV or monitor into a fully functioning Windows-based PC. The ideacentre Stick 300 does not look like a traditional computer, but it performs like one once a 2.4GHz wireless keyboard and mouse are added. The Lenovo ideacentre Stick 300 will be available on www.lenovo.com and will hit retail shelves starting in July. Pricing will start at US $129. Worthy of being crowned the “mini-me” of the traditional desktop PC, the pocket-sized ideacentre™ Stick 300 measures only 15 mm thin, boasts Intel® Atom™ Processor Z3735F, 2G of memory and 32G of storage. It will initially ship with Windows 8.1 but will be available for a free upgrade to Windows 10 starting on July 29. Fully enabled with WiFi and Bluetooth 4.0, the ideacentre™ Stick 300 provides the connectivity you need to power up at any time.